Click here to learn more about BMP High Doors national and international network. BMP High Doors is a company founded in 1997 and managed by its CEO, Danilo Benotto. 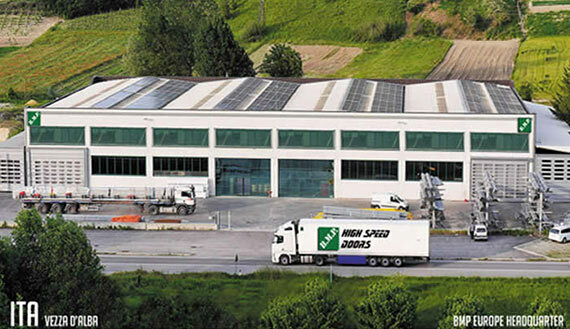 We work in the field of industrial logistics, with a head office located in northern Italy, in Piedmont, and 12 other offices and more than 320 stores in the world. We are one of the world leading companies manufacturing high-speed industrial doors and we install over 10,000 high-speed doors every year, corresponding to about 9% of the world market of industrial doors. We design, manufacture and sell industrial doors, roll-up doors, high-speed doors, commercial doors, insulated doors, roller shutters, electroactive retractable tunnels, hangar doors and, in general, any type of industrial doors, and we also offer an efficient after-sales support service. All our products are designed and manufactured in Italy, before being distributed worldwide. Our services include design, manufacturing and installation, as well as an after-sales support service and scheduled maintenance. Our high-speed doors are designed for clean rooms or controlled temperature and humidity areas, as well as for all those areas that required specific technical parameters to ensure the protection of people or products and materials.